as well as machine downtime. The boom lift will be used at Bluff Point, where Woolnorth Wind Holdings operates 37 Vestas V66 wind turbines mounted on 60-m-high towers, as well as at nearby Studland Bay, where the company has 25 Vestas V90 wind turbines on 80-m-high towers. The V66’s blades are 32 m long, while the massive V90 turbines have 44-m-long blades. Woolnorth Wind Holdings has agreed to a long-term lease of the Genie SX-180 boom lift from Genie authorised reseller Specialist Access Equipment in Bell Bay, and the lift will be operated by contractors commissioned by Woolnorth. In addition, there is the tyranny of height, with the two blade technicians operating at anywhere between 130 to 180 ft in the air. “Given the sheer heights involved, the blade technicians may not have line of sight with the crane operator and have to communicate by two way when they need to move,” said Jessup. In a Genie SX-180 boom lift, the technicians in the basket simply tweak the controls to move to a new section of the blade. The fact that independent crane operators had to be brought in from Burnie, 90 minutes away, also added to the company’s costs, he said. For instance, during inclement weather, Woolnorth was often paying the full rate for the crane to sit idly onsite. “Then when a clear day arrived, they’d need to contract the crane company to get an operator, who was 90 minutes away. This wasted time and good weather – or worse, an operator wasn’t available. “With the Genie SX-180 boom lift now stationed onsite, it can be moved from one turbine to another, to take advantage quickly of the good weather conditions, which helps reduce machine downtime. It is also used for a wider range of activities, including the painting and maintenance of the massive turbine towers. 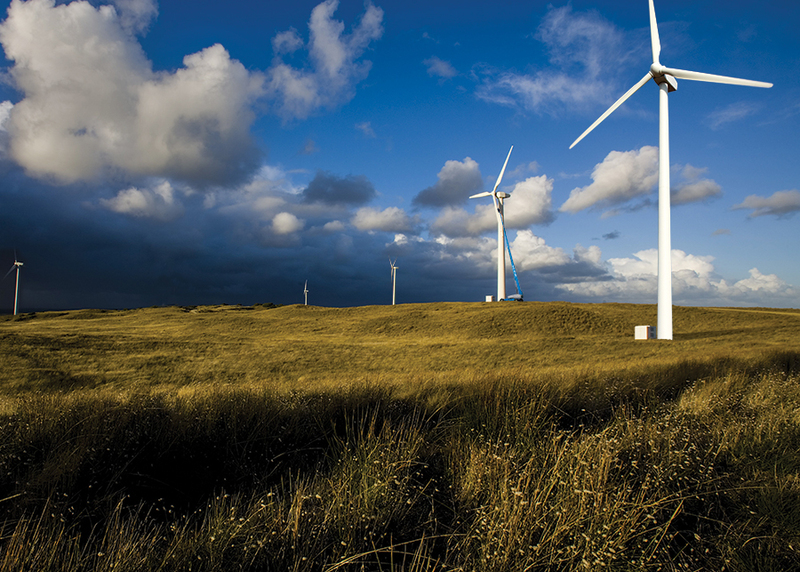 “Over a 12-month period, and given their ability to take advantage of the Roaring Forties, the strong westerly wind that blows across the region, the wind farms at Woolnorth produce on average around 4% of Tasmanian’s energy needs supporting Tasmania’s clean green image, and at the same time provide an important contribution to the local and regional economies,” said Jessup. Specialist Access Equipment collaborated closely with Woolnorth to achieve the cost-effective maintenance solution involving the long-term hire of the Genie SX-180 boom lift. “This arrangement enables us to get a reasonable return on investment based on the machine’s cost, likely number of hours it can work in the challenging weather conditions and so on,” said Jessup. As part of the leasing arrangement with Specialist Access Equipment, Woolnorth has purchased Genie Lift Pro™ training. “Genie Lift Pro Operator Training Courses are high-quality Verification of Competency (VOC) programs delivered through a network of certified trainers across Australia,” said David Greene, Regional Sales Manager Victoria & Tasmania, Terex AWP. Putting the operators of the Genie SX-180 boom lift who are employed by Woolnorth through Genie Lift Pro training, also helps Specialist Access Equipment protect their investment in the boom. “Genie Lift Pro training ensures that all the Woolnorth operators are competent in the use of the super boom,” said Greene.